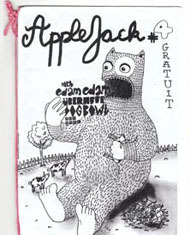 Applejack - ZineWiki - the history and culture of zines, independent media and the small press. Applejack is a zine by Elodie Amandine Roy. Applejack was published in Newcasle-upon-Tyne, England, in the 2000s. It was a photocopied, hand sewn zine that came with a free CD-R. At least 5 issues were released. It was mainly written in French, as the editor was from France and had only recently moved to the UK. In his article "How the fanzine refused to die", in The Guardian (2 February, 2009), Simon Reynolds talked to Elodie Roy; "Roy describes her motivations for doing it the old-fashioned way as "romantic … I wanted to make something that would be visible and material and touchable. I wanted people to be able to read them and keep them somewhere in their house." She says she carries issues of Applejack around with her in her schoolbag and gives them away to "people with friendly faces. I actually like to know who my readers are. I'm not interested in having one million people reading my writing online, because then they're just a faceless, fleshless, distant audience. I like to feel in touch." Contributors included Fyram, Rafff, Laser Boy, and Ciggie. Applejack inspired the zine A Present for Elodie by Michael Duckett. Before moving to the UK, Elodie Amandine Roy lived in France and published the zine Bloom. Simon Reynolds on Applejack, in "How the fanzine refused to die"
This page was last modified on 15 July 2012, at 17:31.